Explore Pioneer Pathways and Other Scenic Traditions in the Bluegrass. The Bluegrass region was the first part of Kentucky to be settled (seeing the breathtaking beauty of the land here, many pioneers decided there could be no better place to live), so there&apos;s a lot of heritage here to explore. Whether your special interest is pioneer pathways or ghost legends, small-town Main Streets or scenic back roads, you&apos;ll find hundreds of fascinating attractions in Lexington and the surrounding region. The following are suggested itineraries in a variety of special interest areas. See the Idea Guide for more information on arts and crafts, horse farms and the Civil War. Delightful small towns encircle Lexington, places of old-fashioned charm and a relaxed pace, where the shopkeepers on Main Street are friendly, and folks still gather on the courthouse lawn. 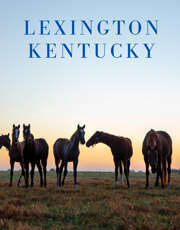 Here&apos;s a tour route from Lexington through four such towns. Start your small-town tour in Paris, the Bourbon County seat, about 18 miles north of Lexington via scenic US 68. Near the grand Beaux Arts-style courthouse is Duncan Tavern (859-987-1788), built in 1788. Now the headquarters of the Kentucky Society of the Daughters of the American Revolution, the Tavern also houses the John Fox, Jr. Genealogical Library. The Nannine Clay Wallis Arboretum, 616 Pleasant St., is a four-acre showplace of roses, dogwood trees and other plants. Continue north from Paris along US 68 to the Nicholas County seat of Carlisle, founded in 1816 on what was once a peach orchard. Although it&apos;s one of Kentucky&apos;s smallest county seats, Carlisle has more than 350 buildings on the National Register of Historic Places - just peachy for old-house fans! On your way back toward Lexington along US 68, stop in Millersburg, whose historic buildings reflect its 1798 founding. The town was home to the Millersburg Military Academy which operated for 113 years. Off US 68, take the Paris Bypass to US 460 west to Georgetown, the Scott County seat. Here you can stroll an old-fashioned Main Street with beautiful historic houses and a Victorian courthouse (home to the Scott County Museum); wander through more than 50,000 sq. 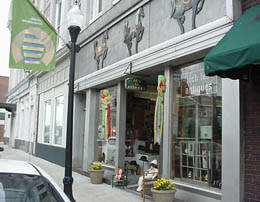 ft. of antique malls and shops; and tour the Toyota Motor Manufacturing facility and visitor center. Bluegrass Note: Shaker Village of Pleasant Hill sits at the center of a 2.4-mile stretch of US 68 that is one of the longest continuous stretches of hand-laid stone fence in Central Kentucky. A bit farther from Lexington, but still within easy driving distance, is the Abraham Lincoln Birthplace National Historic Site, located near Hodgenville (83 miles southwest of Lexington via Bluegrass Parkway). At the site, a granite memorial building houses a pioneer cabin. (270-358-3137). In Hodgenville there&apos;s a bronze statue of Lincoln and the Lincoln Wax Museum. Off exit 42 of the Bluegrass Parkway is Lincoln Homestead State Park. The park encompasses several buildings associated with Lincoln including the 1785 two-story cabin in which his mother, Nancy Hanks, lived while being courted by Thomas Lincoln. (859-336-9925). Bluegrass Note: The Kentucky Lincoln Heritage Trail has a new mobile site aimed at the traveling public. Learn more about our Lincoln connections at www.abelincoln.tours. Drive under a canopy of trees, past elegant horse farms and dry-laid limestone rock fences along Old Frankfort Pike, the 15.5 mile stretch of KY 1681 west of Lexington. This route has been named one of "America&apos;s Most Outstanding Scenic Byways." Along the route, stop at the Headley-Whitney Museum of decorative arts. From Old Frankfort Pike, turn onto Hwy. 1967, Pisgah Pike. This beautiful 4.5 mile stretch of Hwy. 1967 running between Old Frankfort Pike and US 60 takes you past horse farms, creeks, wildflowers, historic Pisgah Presbyterian Church (dating to 1784) and one of Lexington&apos;s most unusual landmarks, "the Castle." At US 60 turn left to return to Lexington. National Geographic selected the route from Lexington to Harrodsburg via US 68 as one of America&apos;s most spectacular drives. The route takes you past horse farms, including Almahurst, now Ramsey Farm, birthplace of 1918 Kentucky Derby winner Exterminator, before descending into the Kentucky River valley. You&apos;ll cross the river at the "Brooklyn Bridge," and climb until you reach the rolling farmland around Shaker Village of Pleasant Hill, the nation&apos;s largest restored Shaker community. Harrodsburg, 7 miles from "Shakertown," includes a replica of Kentucky&apos;s first permanent fort, and crafts and antiques shops. (859-734-5411 or 800-734-5611). More scenic routes can be found in the Bluegrass County Driving Tour, available from VisitLEX. Bluegrass Note: Lulbegrud Creek, near Ky. 15 at the Clark-Powell county line, supposedly was named for its Boone heritage. Daniel and Squire Boone camped near the creek the winter of 1769-70, reading aloud from "Gulliver&apos;s Travels," one of Daniel&apos;s favorite books, each night. The creek&apos;s name is a corrupted spelling of the book&apos;s town of Lorbrulgrud, to which Gulliver was carried for exhibition. Lexington&apos;s Waveland State Historic Site was built in 1847 by Daniel Boone&apos;s grandnephew Joseph Bryan. Boone surveyed the land on which the house is located in 1779 for his nephew Daniel Boone Bryan. (859-272-3611). Take US 25S from Lexington to Ky. 418 and turn right on Gentry Hill Rd. at the small community of Athens to get to Boone Station. Boone lived here from 1779 to 1782. His son Israel, nephew Thomas and brothers Edward and Samuel are thought to be buried here. Stop by for a picnic on this 46 acre Kentucky State Historic Site, or walk the one mile self-guided trail. (859-527-3131). Fort Boonesborough State Park (Ky. 627 at Exit 95 off I-75 south) is a replicated fort built at the site Boone chose for Kentucky&apos;s first fort in April 1775. (859-527-3131). Take Ky. 627 through Winchester, site of the Daniel Boone Festival each Labor Day weekend, and turn right on Old Stone Church Rd. Two miles back on the road is Old Providence Church, where Daniel Boone&apos;s family attended services in the 1790s. In Frankfort, west of Lexington via I-64, you&apos;ll find Daniel and Rebecca Boone&apos;s grave in the Frankfort Cemetery. (502-227-2403). The only Daniel Boone cabin still standing in Kentucky is near the junction of US 68 and Ky. 36 near Carlisle, Kentucky. Daniel and Rebecca built the cabin in the spring of 1795 and lived there until 1799. Open by appointment only. A few miles north of the cabin on US 68 is Blue Licks Battlefield State Park, located near a natural salt lick. In February 1778, Boone and 30 companions were captured by Indians while making salt at the lick. (859-289-5507). Three miles east of Old Fort Harrod State Park, off US 68, you can drive by the site of a cave in which Boone spent the winter, in 1770. Honest! The cave is on private property, but there is a historic marker near the site. (800-852-6663). From the adversities of slavery to achievements in education, racing, business and industry, the story of African-Americans in Lexington and the Bluegrass is a multifaceted and fascinating legacy. As bondsmen, African-Americans arrived in the Bluegrass with the earliest settlers. Lexington became a major slave market to the Deep South. Cheapside, adjacent to the Fayette County Courthouse, was the site of slave auctions until 1864. At Waveland State Historic Site, you can tour restored slave quarters and gain insight into the daily lives of slaves on a Bluegrass hemp plantation. (859-272-3611). The Pleasant Green Missionary Baptist Church at 540 West Maxwell St., the oldest African-American Baptist church west of the Alleghenies, was founded in 1790 by a Virginia slave whose freedom was purchased by his congregation. (859-254-7387). The St. Paul A.M.E. Church, 251 N. Upper St., has been used by an African-American congregation since 1820. The congregation first met in a stable on this site, a portion of which may still exist in the foundation of the building. (859-255-7945). Other sites of interest in Lexington include the Robert H. Williams Cultural Center, 644 Georgetown St., once a home for African-American orphans and elderly. The former Chandler Normal School Building and Webster Hall, 548 Georgetown St., were designed by African-American architect Vertner Tandy, a Lexington native. On 7th Street you can visit Lexington&apos;s African Cemetery #2. Established in 1869 by a society of slaves and freedmen, it is the final resting place of many prominent black citizens: ministers, teachers, business owners and a member of the 54th Massachusetts Regiment, made famous in the film Glory. Also buried there is the jockey who won the very first Kentucky Derby: Oliver Lewis. 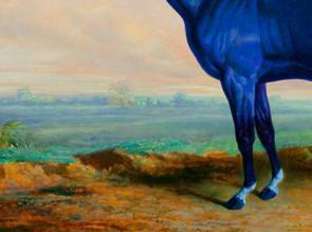 African-Americans played an important role in the development of the horse and racing industries. At the Kentucky Horse Park is the grave of Isaac Burns Murphy, the greatest jockey of the 19th century. He won an amazing 44% of his races, including three Kentucky Derbies. South of Lexington, off US 27, is Camp Nelson. This National Historic Landmark was the enlistment and training site for thousands of slaves who joined the Union Army during the Civil War. Camp Nelson was also a major center for the issuance of emancipation papers. (859-881-5716). Berea College in Berea, south of Lexington off I-75, founded in 1855, was the first college in the southern United States established to offer interracial education. (859-985-3000). Outside the Bluegrass, but still within easy driving distance, is Maysville, where you can tour the National Underground Railroad Museum by appointment: (606-564-3200). A short distance southwest of Maysville is Old Washington, where Harriet Beecher Stowe witnessed a slave auction in 1833. Stowe later wrote that her famous book "Uncle Tom&apos;s Cabin" began with her visit to the slave market in Washington. Be sure to stop in at the Paxton Inn and other underground railroad sites. Call for information on public and private tours. (606-759-7411 or 606-563-2596). Bluegrass Note: The first freed slave in Kentucky is thought to have been Monk Estill, an African-American who lived at Fort Boonesborough. Estill manufactured the gun powder badly needed to defend against Indian attacks. For acts of heroism he was granted his freedom in 1782. In Lexington you can even stay in a haunted hotel and dine at a haunted restaurant. Several unusual figures have been spotted at the The Sire, 120 W. Second St. A little girl in Victorian dress has been seen playing with her dolls near the second floor elevators; an elderly gentleman likes to startle housekeepers by turning on TVs; and another forlorn-looking man has been seen on the lower level. No one knows who the ghosts are -- the building dates to 1916, and was used as a medical clinic, with a morgue on the lower level -- but like hotel guests, the ghosts seem to enjoy a good night&apos;s sleep. Most sightings have been during the day. (859-231-1777). At The Mansion at Griffin Gate, and elegant special events facility at 1800 Newtown Pike, a ghost named Gretta occasionally slams doors, rattles the chandeliers, tugs on dresses and locks folks in an upstairs bathroom. She is thought to be the daughter of the house&apos;s original 19th century owner. (859-231-5100). If you visit The Hunt-Morgan House, 201 N. Mill St., keep your eyes peeled for a woman wearing a turban and bright red shoes. The ghost of Bouviette James, the Morgan family nanny from the Civil War era, was first seen caring for a sick child in the third-floor nursery in the late 1800s. Her shoes were a special gift from Confederate General John Hunt Morgan. (859-233-3290 or 859-253-0362). One of Kentucky&apos;s most famous ghosts is often seen in Frankfort. The "Gray Lady" has haunted Liberty Hall, the 1800 home of John Brown, one of Kentucky&apos;s first Senators, for over a century! She is thought to be the ghost of Margaretta van Varrick. An aunt of Brown&apos;s wife, Margaretta died while visiting the house in 1817. She has even been photographed descending the stairs! Ask tour guides to show you the photo. Also at Liberty Hall, some say the ghost of a 19th-century opera singer has been spotted, and heard singing, in the garden. And a Civil War soldier keeps coming to the back door. House tours begin at 202 Wilkinson St. (502-227-2560). Does Renfro Valley founder John Lair haunt the Old Barn and other sites at the entertainment center south of Lexington? No one knows for sure, but old-time, tinny radio music and strange footsteps have been reported, and seem centered around the barn and the cabin where John and Lula Renfro lived. (800-765-7464). If you visit around Halloween, ask about special events with a ghostly bent. White Hall usually holds a "Ghost Walk" tour, as does Old Fort Harrod State Park and Camp Nelson. The Bluegrass Railroad Museum in Versailles offers spooky train excursions. Bluegrass Note: The only complaint management at Lexington&apos;s The Sire (formerly the Gratz Park Inn) received about the hotel&apos;s ghosts came when horror writer Stephen King stayed at the hotel. King complained - because the ghosts didn&apos;t make an appearance during his stay! If you&apos;re among the thousands who come each year to discover their own roots in Kentucky, you&apos;ll find some of the best genealogical research facilities in the nation, free and open to the public. A great deal of information is concentrated in Frankfort, Kentucky&apos;s capital city. The Kentucky History Center, 100 W. Broadway, Frankfort (502-564-3016), includes more than 80,000 volumes of state, local, military and family history. There are more than 12,000 family surname files and numerous microfilmed court records. It also houses the collection of the Kentucky Genealogical Society. The Kentucky State Archives and Library, also in Frankfort, at 300 Coffee Tree Road (502-564-8300), is the official state repository for state and local records. In Lexington, the University of Kentucky Special Collections and Archives, M.I. King Library (859-257-8611) includes extensive holdings on genealogy and history.